Enter the lands of Forest Spirit, where fantasy and realistic animals under Canine, Feline, Prey and Apex roam. Forest Spirit is an unique roleplaying forum. We accept roleplayers of any level from beginner to advanced, and our staff team and members will gladly help out those who are new to the world of roleplaying. We have a required word count of 150 words although we do not mind if it is shorter now and then, as long as your posts are 150 words long on average. 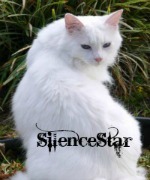 You are free to either create a fantasy-like animal character, or a more realistic character. Any kind of creature would be welcome as long as it is not humanoid. 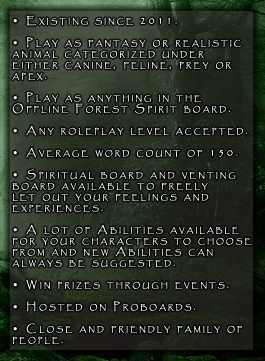 In the Offline Forest Spirit board, members may even roleplay as any kind of species they want and let different species interact with each other. This board is separated from the plot and has no set word count at all, so it also well suited for small roleplays. In our Shop, members can buy various abilities for their characters and other items with their earned Spirit Emeralds. You can greatly enhance your character through many ways, and if you cannot find what you are looking for you may always suggest your ideas. Have no roleplaying to do? You can display your artwork and written works in the Artwork board, or if you have personal problems you may share them with us in the Howl and Roar board and we will listen and give any possible help. We even have The Spiritual World board for those who like to speak about their Spiritual Views, Totem Animals, Dreams... Anything would be welcomed and listened to with openness. These boards are hidden from guests. Both In Character and Out Of Character events are ongoing from time to time with many prizes to be won. Furthermore, there are handy guides available to get started on the site, about roleplaying, writing in general and the realistic behavior of animals. Our staff team and members are friendly, active and very helpful. We will make sure you will get a warm welcome when you join and questions may always be asked when help is needed. So what are you waiting for? Come and take a look if you are interested.